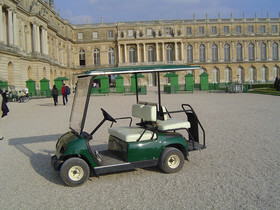 This page provides information about many services in Domain of Versailles. Wear good shoes: Domain of Versailles is huge, you will have to walk al lot during the Palace of Versailles, to joint Marie-Antoinnette’s estate (Petit Trianon, Grand Trianon) 1,5 km far from the Castle. 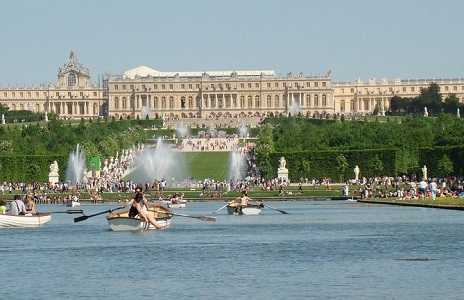 In Summer, don’t forget a cap, solar cream and little bottle of water (50 cl maximum to be allowed during the Palace of Versailles’ visit). In wet weather, don’t forget a folding umbrella. 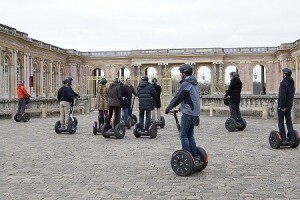 Becareful : Umbrella that doesn’t bend are forbidden inside the Palace of Versailles. Free left-luggage office for your stroller, backpacks, suitcases and umbrellas : Prefer bring with you a baby sling or a baby-carrier without metal frames for children under a year old. Free distribution of audio-guide in 11 languages : French, English, German, Spanish, Italian, Russian, Mandarin Chinese, Japanese, Portuguese, Korean, Polish. 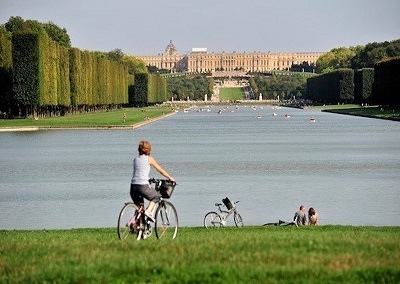 The garden’s designer, André Le Nôtre transformed this wet section of the park into a huge reservoir: The Grand Canal of Versailles. This east-west view from the Versailles’ garden is a source of changing light, perfect to visit in each season. It offers many differents specials views of the palace. 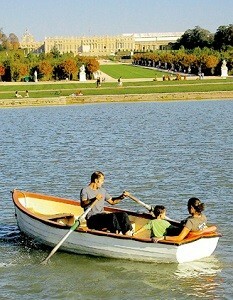 Tour the Grand Canal of Versailles is 5.5 km long. Walking takes about 1h/1h15, rollerblading 35/40 minutes and by bicycle 25 to 30 minutes. This quite flat path is accessible to stroller and wheelchair occupants. The Grand Canal of Versailles is the best place in the park to have a glance all the place. Its 23 hectares of water, 60 meters wide, it forms a cross of nearly 1700 meters in the east-west and 1000 in north-south direction. To full enjoy it, it’s better to hire a boat for an hour. The park is daily open. April to September: 7:00 AM-7:00 PM (for vehicles) and 8:30 PM for pedestrians. October to March: 8:00 AM-6:00 PM. There are several gates to enter through the park: from Boulevard de la Reine, the entrance to the palace or the Saint Cyr road. Admission to the palace park is free, unless you enter through the gardens (the section close to the palace where the various groves are located) on Musical Fountain days during high-season. The price to enter by car is €5 per vehicle. There is car park beside the Grand Canal, at Little Venice. From April to October, you can find Fresh-pressed orange juice in the alleys of Grand Trianon, Petit Trianon, Saint-Antoine’s Gate. 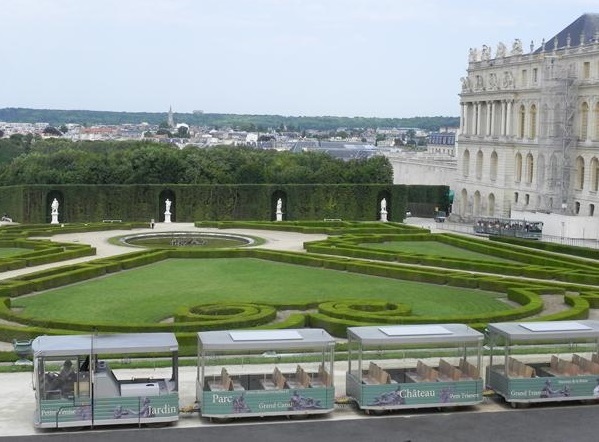 From April to October, you can have an ice cream (fruits sorbets) Grille de la Ménagerie, at the beginning of the Grand Canal when arriving from the Palace of Versailles. 1 cornet : €2,50 / 2 cornets : €4.